The Liyuan Garden, situated on the northern shore of the Lihu Lake in southwest Wuxi, is another famous garden in the lower Yangtze valley. 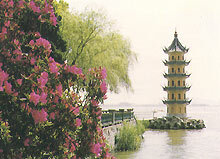 The garden derived its name from the Lihu Lake, also known as the Wuli Lake. Legend has it that 2,400 years ago, after Grand Master Fan Li helped Goo Jian, the duke of Yue, eliminate the state of Wu, he took the wise move of stepping down and returning to the seclusion of the Wuli Lake together with Xi Shi. a stunning beauty. 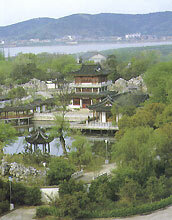 People of later generations changed the name of the lake to Lihu in memory of the grand master. The Lihu Lake is a narrow strip of water of 9.5 square kilometers, looking beautiful with its placid and limpid face. Liyuan is a private garden built in the early 20th century. Classical Chinese garden layout and architecture have been inherited in this garden which merges with the landscape of the Lihu Lake to become the most beautiful spot on the entire lake.